Edmond Memorial running back Tate Troxell took the handoff, shook one tackle and another before slipping past another Yukon defender's reach. Troxell was then faced with a decision that could have put the outcome of the game in balance. Cut back toward the middle of the field or go for the corner pylon? Troxell chose the pylon. He beat one last Yukon defender to score a 61-yard touchdown and break a tie to spark No. 10-ranked Edmond Memorial to a desperately needed 42-21 win over Yukon on Thursday at Wantland Stadium. "I was actually nervous he was going to catch me," Troxell said. "I didn't know if he was going to catch me. I didn't know if I should cut back or not, but I went for it and it worked out." It was the second of three straight touchdowns for Troxell in a long-awaited breakout performance. The 5-foot-11, 180-pound senior finished with 172 yards rushing and two touchdowns on 18 carries. He also caught a 7-yard touchdown pass, which put the Bulldogs up 28-14 in the third quarter. "We've always felt that he was a very, very good running back and a football player," Edmond Memorial coach Justin Merideth said. "I said at the beginning of the year that I think people would be surprised. It took a little bit to get going, but these are the kind of things he's capable of." 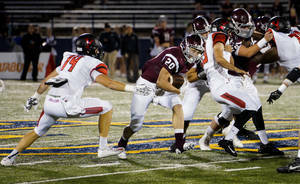 Edmond Memorial (2-3, 1-1 District 6AI-1) piled up 509 yards of offense, an explosion on that side of the ball to help the Bulldogs' defense navigate Yukon's up-tempo spread offense behind quarterback Trevor Smith. Smith finished 18 of 38 for 204 yards, a touchdown and two interceptions. He also scored on a 1-yard run that got the Millers (1-4, 0-2) within a touchdown with 1:17 left in the third. But Edmond Memorial responded with two touchdowns in the fourth quarter to seal the much-needed victory after a 1-3 start to the season. "We needed it for confidence," Merideth said. "You go 1-3 — and I don't care how close the games are — your confidence is going to be shaken a little bit. We needed a win to feel good. We've got the rest of district ahead of us, and we needed to get some wins." The Bulldogs opened the game with a 7-0 lead, but quickly fell behind 14-7 on a 35-yard TD pass from Smith to Rylan Redding and a 1-yard run by lineman John Kearby. Troxell then found his rhythm and the performance he said he's been praying for each week. "I told myself before the game that this was my night," Troxell said. "I've been struggling a little bit in the run this year, and thanks to the lineman and the plays the coaches called just paid off. It was great."